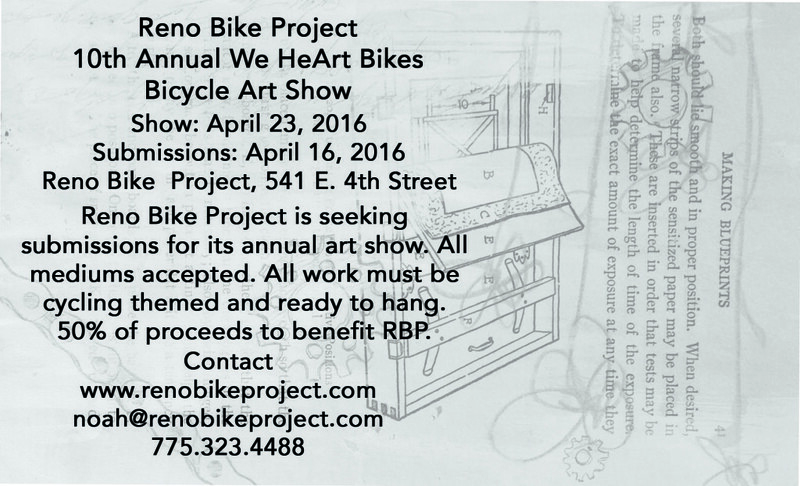 Reno Bike Project’s Freewheels for Kids outreach program provides free bikes to kids in need every holiday season. 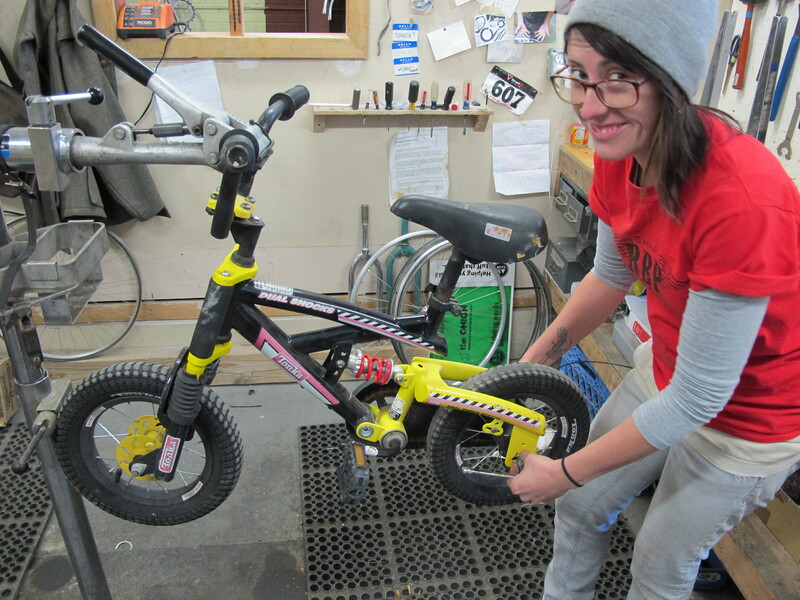 Children’s bikes, donated by community members, are repaired and tuned up by RBP volunteers. Those bikes are then donated to community organizations who distribute the bikes to families in extreme need, many of whom will currently be living in shelters or in temporary housing. 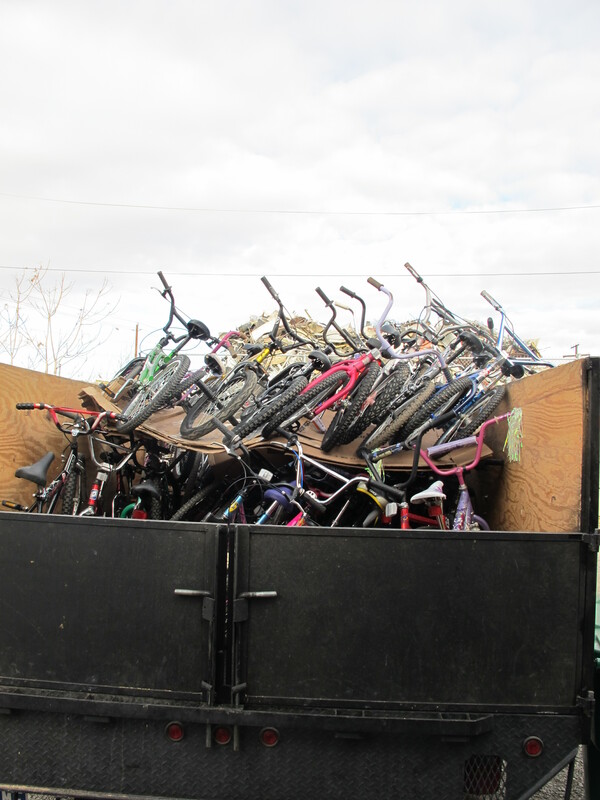 In 2017, Freewheels for Kids volunteers refurbished 132 bikes, which were donated to deserving kids served by The Children’s Cabinet, UNR’s Early Head Start Program, Anderson Elementary, Pine Middle School, Kiwanis Bike Program, Reno Housing Authority, and St. Francis of Assisi Food Pantry. We’re collecting kids bikes for Freewheels 2018 now! 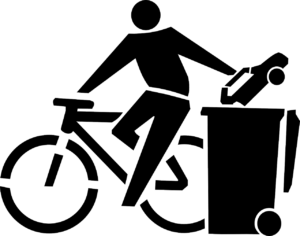 If your family has outgrown or out-of-use bikes, you can donate them to Reno Bike Project and we’ll recycle them into a new home. Cash donations are also appreciated, as we will be replacing parts on some bikes to they’re not only ready to ride, but totally appealing to their new owners, too. Join RBP on our first 2017 community ride event! Keep Truckee Meadows Beautiful is hosting their Great Community Cleanup and we’re riding to the Dorokstar Park site to do our part as cyclists and beautify this area along the Tahoe-Pyramid Bikeway! We leave RBP’s parking lot at 7:30a sharp. Come dressed in layers—it may be chilly early in the morning but should warm as the morning passes (especially since we’ll be working)—but wear pants and consider long sleeves to protect your limbs. KTMB describes the work as: “Trash pick up, brush removal, graffiti removal, family friendly.” Hats, sunglasses, and sunscreen will be a must. KTMB is hosting a volunteer appreciation picnic after the cleanup in Bartley Ranch, with barbecue, beer (21 and older, of course), and prizes. We’ll ride down to the park at 12—join us for the ride and party, or peel away and enjoy your afternoon. RSVP and see who else is going here! 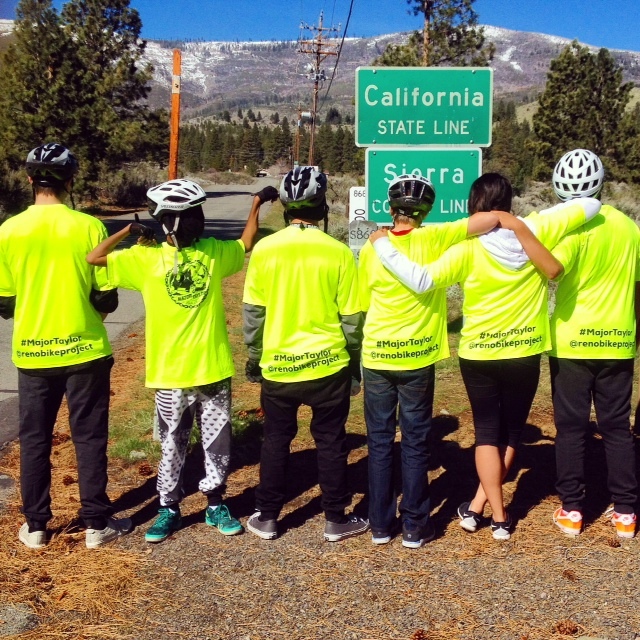 Reno Bike Project is hosting a cycling day camp for youth over Spring Break! We did this last summer and had a great time then, so we are excited to have your child in this Spring’s Major Taylor Ride Camp. This 5-day camp meets March 27-March 31, from 10-1 M-Th and 10-3 F. We will teach road safety, bicycle handling skills, basic mechanics, and more. 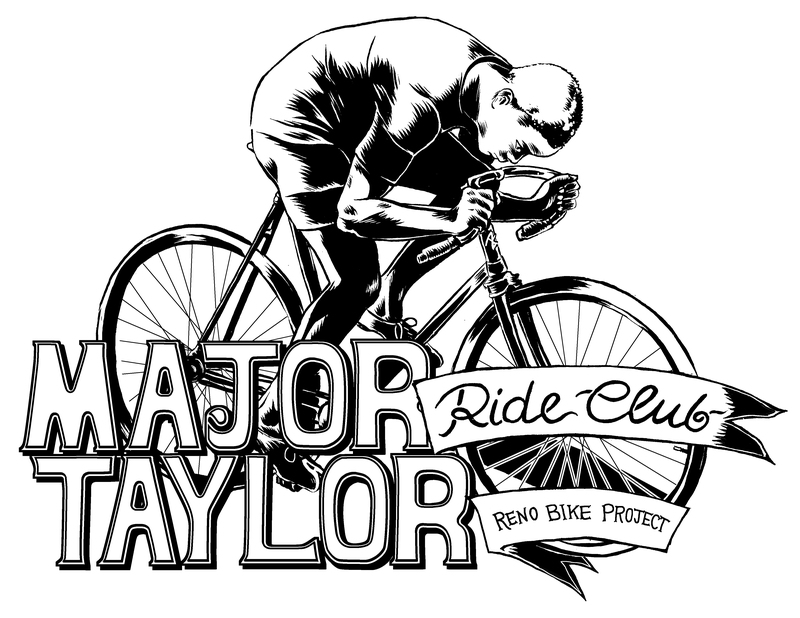 The Major Taylor Ride Camp is educational, enjoyable, and affordable! We realize there’s a bit of a gamble on the weather cooperating, but we will offer full refunds in the case camp is canceled due to atmospheric or ground circumstances. Follow the link for more information and to sign up now. 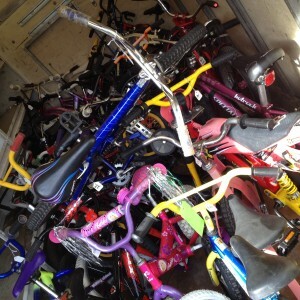 Reno Bike Project’s Freewheels for Kids outreach program provides free bikes to kids in need during the holiday season. Children’s bikes, donated by community members, are repaired and tuned up by RBP volunteers. Those bikes are then donated to community organizations who distribute the bikes to families in extreme need, many of whom will currently be living in shelters or in temporary housing. 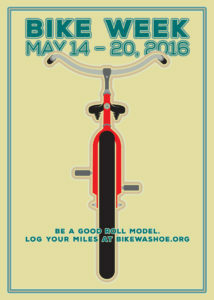 Our 2016 bike drive is underway! 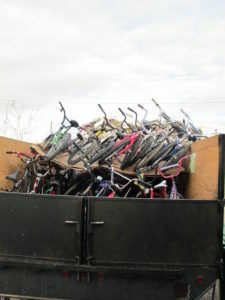 If your family has outgrown or out-of-use bikes, donate them to Reno Bike Project and we’ll recycle them into a new home! Cash donations are also appreciated, as we will be replacing parts on some bikes to they’re not only ready to ride, but totally appealing to their new owners, too. Our two Freewheels volunteer wrenching parties will be on December 3 and December 10 from 11am-3pm. Volunteers don’t need to have any prior mechanical experience to come in and help; our mechanic educators will oversee and assist in all repairs, and refreshments will be provided as a small thank you. This is a great learning opportunity for new volunteers. Join us for a different kind of community ride from what we’ve done before with our Sloth Pedal series: on the morning of October 15 we’re meeting at Horseman’s Park for a TRAIL RIDE! Come with your knobbly tires, breathe that cold, crisp air and appreciate the gorgeous colors of Fall with friends. 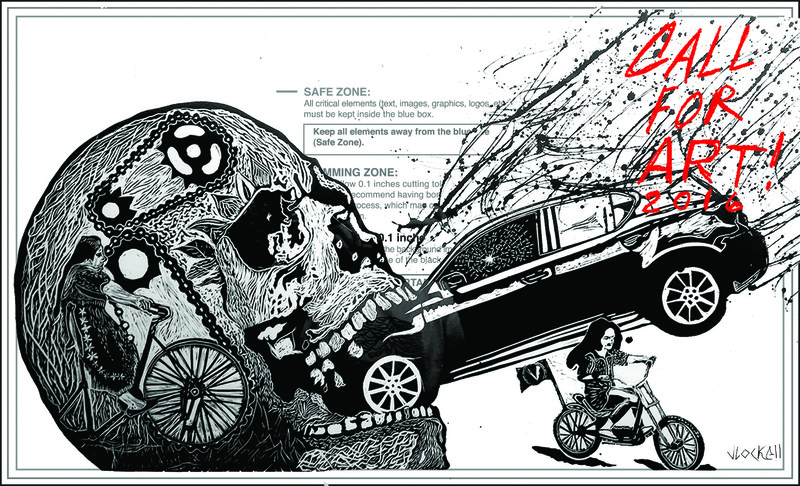 If you’re new to riding off-road, no worries! This is a perfect trail system for beginners. Sign Ups are open for Major Taylor Summer Day Camps! You can fill out the application online here or download the application here. 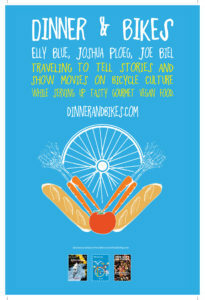 Join us at Sundance Books & Music on June 8 for an evening of inspirational storytelling about bicycle culture and delicious food, presented by Elly Blue, Joe Biel, and Joshua Ploeg. This is their sixth annual U.S. tour bringing people together to eat delicious food and get inspired about bicycle transportation. As the audience arrives, they serve themselves from chef Joshua Ploeg’s seven-course gourmet vegan and gluten-free buffet spread. While the audience is eating, local advocates discuss their work and local issues and initiatives. Then, Elly Blue and Joe Biel co-present a new interactive discussion and presentation including eight short films about Groundswell movements—incidences where people demand better neighborhood conditions and successfully implement them. Stories include how Reading, PA came to be 13th on the East Coast for bike commuting without any advocacy or government spending; former gang members riding bikes to raise awareness about gang violence; Mexico City’s superhero of the streets, Peatonito; the story of the League of American Bicyclists’ equity council; how the City of Portland’s Sunday Parkways worked as a response to gentrification; and how cyclists are representing themselves and creating their own voices all over the world. Throughout the evening there are plenty of opportunities for discussion, questions, and browsing the Microcosm pop-up book and t-shirt store. Pre-sale tickets are $20 through Paypal or $25 at the door the day of the event. 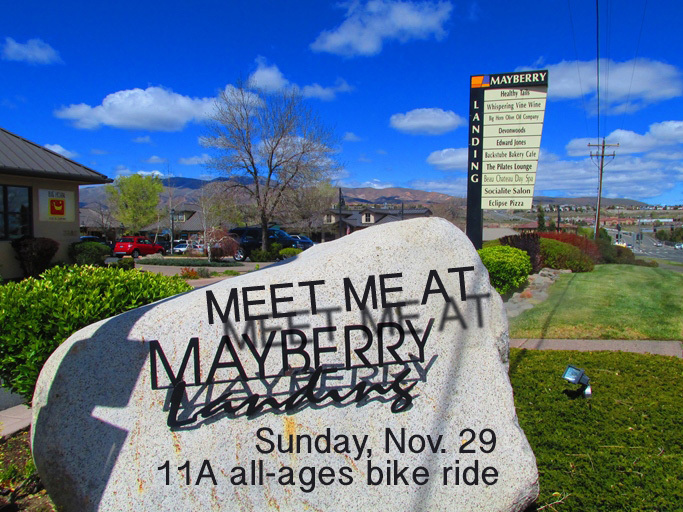 For this month’s Slow Roll, we plan to lead you along a beautiful western portion of the Truckee River and introduce those who may not be familiar with the fine local establishments grouped at Mayberry Landing, the business plaza on Mayberry & McCarren. This is recognized as the start of the popular “Verdi Loop” bike route, so these businesses see a lot of cyclists and welcome our visit. Riders are encouraged to show them that “bikes mean business” by getting a bite from one of the restaurants or perusing the other interesting shops! Click the linked flier to see more info and which businesses are giving Slow Rollers a special discount or freebee!